The Ginza line in Tokyo's subway, for the class 01 subway train. The line goes from Shibuya/G01 to Asakusa/G19. For OpenBVE the elder BVE 2 and BVE 4 routes can be used. In both alternatives are the A1649 alternative that begins at G19 and goes to a lay-up track beyond station G01; the B1649 alternative goes in the opposite direction beginning at the lay-up track. For BVE 2 only there is also the B1507 alternative that begins also at the lay-up track at G01 and goes to the station Ueno/G16, where the train is taken out of traffic and is driven to the Ueno depot. Very well-made route with a lot of details, soft curves and realistic light conditions. The following applies when driving from the Ueno station and to the depot: On the track to the depot is a stop sign in the track (white board with a circle in black with a horizontal line through the circle). Stop by that sign and wait until a yellow light in the distance becomes lit indicating that the road crossing protection ahead is activated. In the depot yard a place to stop again is indicated before the lay-up tracks. Finally, stop the train 5 m before the end of the lay-up track, then move the train carefully forward to the indicated stop position. From April 1 2004 (no April fools' joke) every station in the Tokyo subway has a normal station name in Japanese, but also a number. The number is composed of a western letter and two digits. The letter indicates at which line the station is, the number which station counted from one of the line's terminal stations. The Ginza line has the letter G and the stations are numbered from 01 till 19, the terminus station Shibuya is station G01 and the other terminus Asakusa is station G19. This number system was implemented to make it easier for foreigners to ride the subway. The BVE 2 and BVE 4 versions of this route, which are compatible with OpenBVE, have disappeared from the creator's website. Object files, common for the BVE 2 and BVE 4 alternatives, to be placed in the LegacyContent\Railway\Route directory. Sound files, common for the BVE 2 and BVE 4 alternatives, to be placed in the LegacyContent\Railway\Sound directory. Route files for BVE 2, to be placed in the LegacyContent\Railway\Route directory. Route files for BVE 4, to be placed in the LegacyContent\Railway\Route directory. The Hanzomon line in Tokyo's subway. The line goes from Shibuya/Z01 to Oshiage/Z14. For OpenBVE there is the alternative C1367S for the class 08 subway train starting at the railway station Hikifune at the Tobu Isesaki line then going to the subway's Hanzomon line at which it then continues as train B1367S from Oshiage/Z14 to Shibuya/Z01. Very well-made line with many details, soft curves and realistic light conditions. In the beginning of the tunnel between Hikifune and Oshiage is a problem with transparency in the graphics that does not work properly. Openings in the wall to the left of the track are shown as blue. 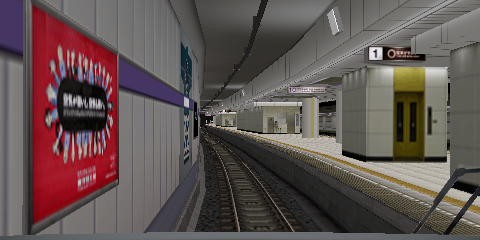 The following applies when driving this route in OpenBVE: In the beginning of alternative C1367S, before departure from the railway station Hikifune at the Tobu Isesaki line, the safety system should be activated with the 8 key so that the indicator light TOB is lit. Also, the train's destination sign at the MFD should be set with the Page Down key to an alternative with 4 green characters in a green frame. When the train has stopped by the platform at next station, Oshiage/Z14 at the subway's Hanzomon line to continue as B1367S, the train's brakes should be set in the emergency brake position and the reverser in neutral position, the safety system should be changed with the 7 key so that the indicator light TRTA is lit, and the train's destination sign at the MFD should be set to an alternative with 2 red characters in a red frame. Hanzomon line has the letter Z and the stations are numbered from 01 till 14, the terminus station Shibuya is station Z01 and the other terminus Oshiage is station Z14. The BVE 4 version of this route, which is compatible with OpenBVE, has disappeared from the creator's website.